Going the Distance. The Longest Flights in the World. EARLIER THIS WEEK, Qatar Airways launched what is, for now, the longest nonstop service in the world. Flights QR920 and QR921 will operate daily each way between Doha, Qatar, and Auckland, New Zealand, using the Boeing 777-200LR — the ultra-long range variant of the 777. The route should prove popular with European and Gulf area tourists headed to New Zealand. The flights will take somewhere around seventeen hours each way, depending on winds. Because of these variations, it’s mileage, not time aloft, that’s the better measuring stick. The direct, great circle distance between Doha and Auckland is just under 7,850 nautical miles. All pairings are “great circle” distances, using nautical miles (elsewhere in the media, most sources use statute miles, so be careful). It’s interesting how similar most of the distances are. Six of the ten longest flights differ only by about 200 miles. Here’s my friend, the inimitable Richard Quest, enthusiastically (does he have any other mode?) discussing the Doha-Auckland flight, and making some great points about the evolution of long-haul travel. As Quest notes, the challenges of long-haul flying are no longer technological so much as human. That is, how do you keep passengers comfortable, or even sane, with flight times pushing twenty hours? In the first and business class cabins, things have never been more swanky and luxurious than they are today, but in economy class, no matter how many video channels or free cocktails you give people, there’s a point beyond which the simple physiology of being human makes the experience intolerable (this is probably part of the reason that Singapore Airlines chose to operate its New York flights in an all-business class configuration). Quaint, indeed, seem the days when Pan Am executives sat in their Park Avenue skyscraper, scratching their heads over ways to make a 747 reach Tokyo without refueling — a mere 5,800 miles. Thanks to aircraft like the 777LR and A380, almost any two commercial air markets in the world are now linkable in a single fell swoop. What’s left after that? Some ideas might be São Paulo–Tokyo or Auckland–London, both clocking in at a shade under 10,000 miles. (Shattering the 10,000 frontier — Buenos Aires–Beijing, anyone? — remains, let’s just say, a long-haul longshot.) But although we’re almost there technologically, that doesn’t mean such routes are economically feasible. Because two cities can be connected means little to an airline unless there is an exploitable market to justify connecting them. You’ve got to fill a certain number of seats, at a certain price, for a flight to be profitable. The longer the route, the harder that task becomes. Still, it’s fun to think about. Asia-South America is a kind of last frontier of long-haul flying, and São Paulo, Brazil, has the largest Japanese population of any city outside Japan. Japan Airlines used to run an add-on segment to Sao Paulo from New York, connecting through JFK to and from Tokyo. Could a nonstop ever be feasible? In the 1970s, Boeing produced a variant of the 747 with a substantially shortened fuselage — making it considerably lighter — but with the same fuel capacity. The result was the 747SP, the longest-range jetliner of its day. Imagine, for a moment, a 777SP, or an A380SP, an ultra-ultra long-hauler able to close the gap on those last outlying city pairs. Here, using the Great Circle Mapper tool, you can create your own fantasy routes. My personal distance record is a comparatively modest 6,830 miles, covered in sixteen hours and six minutes, on a Delta Air Lines 777-200LR from Detroit to Hong Kong about six years ago (Delta no longer flies this route). That, quite enjoyably, was in business class. Being in a premium cabin pretty much negates any downside of a flight that long. On the other hand, there’s also the 6,925 miles, covered in fourteen hours and forty-six minutes, that I spent in economy aboard South African Airways flight SA202 from JFK to Johannesburg. (Notice how the second flight was a longer distance, but flown in less time.) I know it was exactly fourteen hours and forty-six minutes because there was a digital timer bolted to the bulkhead in front of me, feeding us a minute-by-minute update. Watching the hours tick by seemed a torturous proposition, until a certain passenger was bold enough to tape a piece of paper over the clock. I didn’t peek again until we’d landed. Photo by the author. Qatar Airways A350 and 777. Great article, good information for those who think the A350 and the Dreamliner are in competition with one another. Both CAN fly long distances, but the Dreamliner can also be a very economical medium range aircraft also, ask ANA. The A350 plans grew too big to compete with the 787, now it’s in competition with the superb 777. The 787 in time will own the smaller hub, long distance routes such as Denver-Tokyo, Salt Lake City-Hong Kong, Phoenix-Paris, Charlotte-Amsterdam. The A350 can’t fill all those seats on such a route, another example of AirBus dreaming TOO big or guess how many A380’s will be parked or parted out in 2018. The A350 is more or less an A340 replacement that was the most direct 777 challenger in the Airbus product line before it. The A340 sold poorly against the 777 due to having four engines over the 777’s two. The A330 is in more direct competition with the 787, which is reinforced when Airbus has launched the upgraded A330-NEO to counter it. Toronto->Hong Kong is a regularly flown route for many years @ 7810 miles. You’re using statute miles. With nautical miles it’s about 6800 — not quite in the top ten. I believe Honolulu to Johannesburg South Africa is about 11,900 s.miles. That may well be true, but who is flying Honolulu-Johannesburg? Don’t the stealth bombers fly from MO, USA to the Middle East, drop bomb, then back, nonstop? In air refueling of course, but that’s almost 14,000 miles non stop. The B2 cockpit is small too. I think the longest ever in terms of flight time remains the Qantas Perth – Galle (Sri Lanka) which was flown by Catalinas during WWII. Flight times averaged ~30 hours. The flights were timed to pass over Japanese held territory at night, so passengers saw the sun rise twice during the flight. It would not have been a pleasant journey. You forgot to list at number 8 the Etihad 772LR that does AUH-LAX daily. It beats the EK DXB-LAX by a few dozen miles. I’ve flown this sector 4 times now, longest clocked in at 16:45. Plain and simple, it’s a long flight. Thanks, Tim. I’m not sure if this flight is new or not, but you’re right, it should be on the list. I’ve gone and added it in. It’s interesting how EK flies its LAX route using an A380 while Etihad uses the little old 772. That’s a huge capacity difference! I love flying around the globe. I accidentally landed on your website. You have opened my eyes to flying. Lime the distance and time take an. I wish there is a direct flight JFK to MNL. I bet you do, the Cathay Pacific Flight 841 departing JFK looks good with just a short layover in Hong Kong but the returning choices are just ugly, real ugly. However the fares start under $800 R/T exactly half what I pay to fly PHX-LAX-MEL. Has Cathay gone discount? Off the top of my head have you tried JAL JFK-Tokyo-MNL? I’m sure the fares are higher but I have to assume there are many more flights and shorter layovers. I always have fathomed and dreamed over an aircraft that could go non-stop half-way around the world fully loaded like Asia to South America. I also have a few criteria for the aircraft I could see being able to do this feat. 1. The aircraft must be twin engined: Twin engines are naturally more fuel efficient then quad engined aircraft. 2. The aircraft must be a wide body with much fewer seats then normal: While this makes it harder to be profitable, fewer passenger seats means more room for fuel weight that is needed for a such a long flight. Wide body aircraft also have more room for fuel. 3. The aircraft needs to have an exceptionally long wingspan to carry more fuel and have the range to do it. 4. The aircraft needs to have the most modern fuel efficient engines available to it. With those criteria, a theoretical Boeing 777XSP and A350SP would probably be the most ideal for such a mission. I could possibly see an A350SP being made by taking the slightly longer A350-1000 Wingspan to the A350-900ULR and a 777XSP by combining the updated 777X Wingspan and engine to the current 777-200LR fuselage length in the form of a 777-7X. The 777X in development currently has the 777-8X that is in between the current fuselage length of the 777-200LR and 777-300ER, and the 777-9X that is longer then even the 747-8I that is currently the longest passenger aircraft. All of this though is purely theoretical and fun. I don’t know about Fun, I do question your rule: The aircraft must be twin engined: Twin engines are naturally more fuel efficient then quad engined aircraft. That’s not necessarily so. Capacity is equally important. The A340 is a Dinosaur that should never have been built, but a 500 passenger A380 actually has a lower seat mile cost than the 777-300; based largely on fuel burn. I’ll add the reference in a minute. You can’t always go long and go in an aircraft with a smaller capacity. The charts don’t copy/paste properly so you’ll have to look up the following link yourself. The 777-200LR is less efficient than the a380, as is the 747-8, but overall the figures are so mixed up your 2 is better than 4 maybe a bad assumption, much depends on the most recent engines as well as the airframe construction. The 747-8 is built like a tank, the a380 upper cabin collapses if the upper/lower divider is removed, hence the 747-400 and 747-8 can be converted from passenger to cabin use when more efficient aircraft replace them. I would prefer to fly in the 747, personally.when Qantas mechanics were threatening to strike on the issue of time allowed for a380 work, the president said: “It’s all plastic we have to retighten everything”. Whether completely true or not, where there’s smoke there’s fire……..
Two other theoretical ultra long-haul flights between Asia and South America that are over 10,000 Nautical Miles in length and close to antipodal are Buenos Aires to Beijing China (http://www.gcmap.com/mapui?P=PEK-EZE&MS=wls&DU=nm) and Buenos Aires to Shanghai China. (http://www.gcmap.com/mapui?P=PVG-EZE&MS=wls&DU=nm) Also a great chunk of Argentina is also directly antipodal to China. Interesting. Chinese carriers are getting adventurous, and it * could be * just a matter of time before one of those city-pairs becomes a reality. I’d expect a route to Sao Paulo before one to Buenos Aires, but distance-wise it’s more or less the same thing. Actually Sao Paulo to Beijing (http://www.gcmap.com/mapui?P=PEK-GRU&MS=wls&DU=nm) and Sao Paulo to Shanghai (http://www.gcmap.com/mapui?P=PVG-GRU&MS=wls&DU=nm)are a bit closer to Sao Paulo then they are to Buenos Aires. They are still though far longer the current distance champ between Singapore and Newark that will resume when Singapore Airlines gets the A350-900ULRs delivered. What about New York to Johannesburg on SAA? Comes in at number two on yr list according to great circle mapper…. Refuels in W Africa on outbound trip but flies direct on journey back. I have taken that flight. It was non-stop both ways, it think the West Africa stop depends on the weather/ prevailing winds. It was SO long, about 12 hours in I wanted to cry! Are there any flights that you know of that fly over or near Antarctica? I would love to see the continent from the air. Qantas’s flight from Sydney to Buenos Aires got you over parts of the Antarctic Ice Shelf in Winter, however they keep and adding and dropping that route (currently dropped). Right now the closest you will get is on Auckland to Buenos Aires on Air New Zealand. Air New Zealand had the acclaimed super-luxurious DC-10 tour of Antarctica until the very experienced flight crew lost track of their location and altitude crashing into Mount Euribus (sp?) the highest point in the region. No more flights recreational or otherwise have been allowed not connected with scientific operations ongoing. It’s just like the North Pole with some humans in permanent raindeer, caribou, but no penguins. If I remember correctly from Auckland to Antarctica it was like a 4-hour flight, returning to Christchurch on the South Island was only 30-45 minutes shorter. The point being, Antarctica is a hell of a long way from the pathways taken by commercial passenger flights, and possibly navigational aids and communications. The longest possible route between commercial airports is, I believe, Madrid to Auckland, at 10,580 nautical miles. The earth’s circumference is 21,639 nautical miles, so that’s just 240nm shy of halfway around the planet. Not that there would ever be market demand for this route, but it sets the outer limit of what a long-haul aircraft would ever aspire to. It would also make for some pretty cool routing options – depending on the weather conditions, you could end up flying over the north pole, the south pole, or anywhere in between. Madrid to Auckland http://www.gcmap.com/mapui?P=MAD-AKL&MS=wls&DU=nm&E=330 is actually tied with Shanghai to Buenos Aires http://www.gcmap.com/mapui?P=PVG-EZE&MS=wls&DU=nm for the longest great circle distance. I can see Shanghai to Buenos Aires taking off. Not so much with Madrid to Auckland. Might as well save a bit of extra money for some extra luxury on such a long flight, assuming you’re able to afford such a flight in the first place, and not spending every penny you have for it. I believe that you’re looking at statute miles. Switch to nautical miles and give it another try. The local newspapers were impressed when casino mogul Sheldon Adelson recently flew his A340-541 (tail number VP-BMS) nonstop from TLV to HNL. That’s 8667 miles, 7537 Nautical miles. The great circle route passes north of Russia most of the way. Airline transit over some of the first countries you encounter (at least for ElAl) is dubious, so I don’t know how close to that route they flew. Flight time was about 18 hours. Since the plane carries only Adelson and his retinue, in apartment style comfort, I guess it was pretty relaxed. I would guess that individual billionaires have an advantage over Gulf state kings for this competition — smaller retinues. When I took SQ 22 SIN-EWR block time just under 19 hours, I spoke with the relief pilot who said we were taking a longer route by mileage due to wind conditions on the route, and told me it was slightly longer than 10,000 statute miles, which translates to 8,695 nautical miles-that sounds like quite a bit more than the direct great circle route – Could jet stream conditions make that big a difference in flight track mileage? Missing from this list seems to be SFO-SIN, which GCMap lists at 7,339 NM and is operated by both UA and SQ non-stop (789 and A350, respectively). You are correct. I’m not sure how this slipped through. When I was compiling the list, SFO-SIN was one of the pairings I checked. In fact I double-checked it. I must have been entering something incorrectly. Thanks for catching this. The list is now updated. As one commenter above mentioned regarding pre-jet commercial passenger flying, there have long been trips of very long duration. In the last years of the 1970’s, as cabin crew for Pan Am, I flew many trans-Pacific non-stop flights on Pan Am’s 747SP’s. As my logbook evidences, some of Pan Am’s westbound non-stop SP trips into South Asia destinations clocked in at just under 20 hours (block-to-block) because of winds. I remember that all too well because, even though I had been flying 10-12 hour 747 flights several times each month for years, I was knocked out of the air when I developed a severe allergy to cigarette smoke as a result of those super long-haul 747SP flights. Because none of the medications that would have treated that allergy were legal for cabin crew, I had to resign from a job I loved. (As a junior purser, I did not have the seniority to avoid the super long-haul SP flights.) The allergy to smoke disappeared soon after my last 747SP flight, never to reappear. Gotta say that unlike you, Patrick, that while it certainly helps I don’t find business class makes super-long flights OK. When I fly Auckland-London, which is approximately two twelvish hour flights back to back, although I fly business it’s the stopover that stops me from losing my sanity. Similarly, I can fly pretty much any amount of time in economy provided it’s in smaller chunks. A few weeks ago I flew Auckland-Santiago in economy – that was three five-hour chunks with stopovers in Tahiti and Easter Island, which was fine despite the Tahiti-Easter Island leg leaving at 2.30 am. (I don’t sleep in economy anyway.) I will not be getting in the queue for the Auckland-Doha flight. To the scheduled long-distance flights we also need to add the long ones that are adjusted for ad hoc reasons. During the eruption of Eyjafjallajökull, in 2010, I was in Nairobi and my scheduled return to NY on Swiss through Zurich was cancelled. My office routed me through Dubai, and the great circle route was out of the question. The Emirates flight went across the Mediterranean, skimming the north coasts of Libya/ Tunisia and Gibraltar…if my memory is correct, the flight was well over 15 hours plus and during the day (well, much of it). This was tedious, even in business, far more than the planned long flights I have done from Johannesburg to New York. I usually think of myself as having a fair grasp of geography. But — Mercator projection or no Mercator projection — it’s hard to imagine Auckland-Doha being further than NY-HK or even Vancouver-Sydney. Not that I’m casting doubt on it. Oh well, ya learn something every day, such as that if Brooklyn were an independent city it would be the fourth-largest in the US. Or so I’ve heard. My son and I enjoy this one: Air India Delhi to SFO, does the (only?) “circumnavigation” of the earth in a round trip. – AI 174 SFO-DEL takes basically that route, but goes slightly East of direct North… Canada-Greenland-Russia-India, missing all of Europe. Flight Aware says 8,405 actual miles. – But then AI 173 DEL-SFO goes directly East over the Pacific… Flight Aware says actual 9,699 miles yesterday, planned 9,197 miles. So… City A to City B and back to City A via totally different routes, both going East. Anyone know of any others? DEL-SFO is 6697 nautical miles. And remember these are direct great circle routes, for reference; they are NOT the actual routes flown, which will vary slightly day to day depending on weather, winds, ATC restrictions, etc. I did EWR-PEK-EWR in 2006. EWR-PEK was over the pole, slightly to the Europe side (about 87 degrees north, north of Svalbard). PEK-EWR was up the east coast of Siberia, and never got north of the Arctic Circle (northernmost point was near FAI, which is about 65 degrees north). I think most routes between the eastern US and China could go either direction, depending on wind and geomagnetic conditions. Airlines are not allowed to use transpolar routes during geomagnetic storms because they would have no way to communicate north of 82 degrees, geosynchronous satellites being below the horizon at those latitudes. Nope. It’s correct as it is: 6,828 nautical miles, to be exact. I think you’re using statute miles. Not necessarily a correction, but for several years SQ operated the EWR-SIN nonstop with two classes of service. Business and Executive Economy. I made a few trips in Executive Economy and was comfortable enough. Quite comfortable, in fact. That flight was a great value and much better than the JFK-FRA-SIN option (the return from SQ to FRA was over 14 hours on its own due to headwinds and the FRA airport was not a great place to get booted off the plane for a layover). I was a bit heartbroken when they switched over to all Business class for the EWR-SIN flight. The best thing I see on the list is there are “7” Boeing aircraft and only “3” copy cats (school buses)!….Just saying! Patrick, was that “certain passenger” you? You mention JAL’s Tokyo-New York-Sao Paulo flight: The sadly-missed Varig used to fly from Tokyo to Rio de Janeiro via Los Angeles and Sao Paulo on the same plane….although, ludicrously, you would still have to get off at Los Angeles, go through immigration and be frog-marched around the airport for an hour. I was on the LA-Sao Paulo leg of Varig perhaps 15 years ago. Fine flight except the return leg where I ended up in the last row of the plane in the smoking section. When the no smoking sign was turned off, it seemed all the Japanese from the front came back by me and lit up. I felt like a 20 hour flight. A long shower when I got home still didn’t seem to get the smell off. lol! Today’s longest-duration flights are several hours less than some at the end of the propliner era, around 1958-59. The longest-range airliner at the time was the Lockheed 1649 Starliner. Only 44 were built, operated from 1957 by TWA, Air France, and Lufthansa; they were replaced starting in 1960 by long-range 707-300 jets. TWA named their 1649’s “Jetstreams” even though they were not jets. 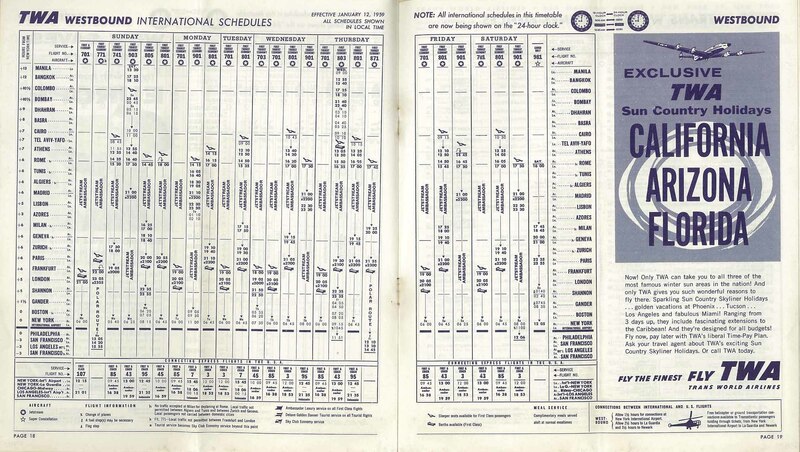 In 1959, TWA’s timetable listed a San Francisco-Paris non-stop at a 19 hr 35 min eastbound and 22 hr 10 min westbound. First class in back was 14 sleeper seats plus swing-down berths; the 60 tourist seats forward were about the same size as today with a bit more space between rows. No movies. No music. Eat, sleep or read with the unceasing noise and vibration of pounding pistons and whirling props. Cruise 350 mph around 20,000 ft.
That same route today is half the time at twice the speed and altitude, with a lot less noise and hardly any vibration. Maybe the “good old days” weren’t that great after all. I’m not a fan of super-long flights, I remember flying United LAX->SYD on an ex-PanAm 747SP back in the 80’s. There were 4 screaming babies in coach and I was stuck next to a guy that looked and sounded like General Burkhalter from Hogan’s Heros who talked the whole way. That’s one of the reasons I like flying Icelandair to Europe from Seattle over the other options. With a 45-50 minute layover in KEF it’s only slightly slower to Paris than the non-stop and I get to stretch my legs a little. Also for flying certain places it’s actually better. It was far nicer flying SEA->ARN->LED in 13 1/2 hours than flying SEA->AMS->LED in 16 hours. So give me more flights with fast connections if at all possible. DXB-AKL has been running for a while now, I took it in June last year. It’s a hard flight even in business, especially as Emirates still run their old planes on that route. From London going via LAX is slightly shorter but the transit time isn’t as good and Emirates is MUCH cheaper than AirNZ. DXB-AKL has not started yet, as a nonstop. It begins next month. And I’m not sure what you mean by “old planes.” Emirates flies only A380s and 777s, the oldest of which, by most standards, are still very new. (The airline recently “retired” its A330s, though even these planes could hardly be described as “old.”) Interior layouts can vary with the route, mostly in first or business class, and maybe that’s what you’re talking about. But so far as I know AKL has always been served by planes with the premium long-haul configuration. In lists like these I never seem to see JFK-TPE, which I’ve done four times now (7,808 miles, according to GCM). The longest flight was, I believe, ~16h40m. At any rate, space and service on EVA basic economy seem to have shrunk, as everywhere else…it’s a long time to be back there. At least TPE is nice, even if touchdown is before 5 am. I think you’re looking at statute miles on the GCM. JFK-TPE isn’t that long. Ahh, thanks. It’s 6,785 nmi then. It was a good flight. I’ll post a write-up/review at some point. Patrick, if on your longest flight you had just continued for another 35 hours you would have matched Apollo 11’s flight time to the moon (51 hours). But I guess then your 777 would have had to have boosted the engines to 35,000 mph. But you made it a third of the way! Patrick, as you say it’s not the distance that matters, it’s flight time. Prevailing winds are usually from west to east, which is why eastbound transcon flights usually take less time than westbound. The difference is even more pronounced over the North Pacific on non-stops between the USA vs Japan, Korea and China. You’re seriously mansplaining winds to Patrick?! Lol. I am sitting here in New Zealand enjoying dinner after having completed JFk-LAX-AKL a few days ago. I was just wondering why you think this new route will be popular with North American travelers? That seems like a huge difference even if you are in business or first class on a Gulf carrier. So I don’t think this route will be that much of a draw for North Americans or English. I would like to se AKL-JFK direct at 8,828 miles! The English will love it. No sane non-American will chose to transfer in the US. As long as the US doesn’t get the concept of transit, the rest of the world will avoid flying through a US airport. They’ll chuckle and gladly chose another carrier. US aviation’s loss. And this, for once, was screwed up well before Herr Trump took over. Odd comment considering Trump has been quite critical of the condition of US airports. This isn’t an airport infrastructure issue so much as a DHS/CBP policy issue. These organizations prevent recognition of “in transit” and require all passengers, regardless of visit length, to clear customs and immigration formalities just like if they were visiting the US. At one time I (ignorantly) though a non-stop would be more fuel efficient as it would avoid a second takeoff. I’ve come to learn that’s not the case. If the flight is 8k miles and requires 100k pounds of fuel a flight of 4K miles would require significantly less than 50k pounds of fuel due to a lower takeoff weight.. But, I’ve never the actual numbers on an ultra-long haul flight.